Please refer to our stock # WTX2 when inquiring. 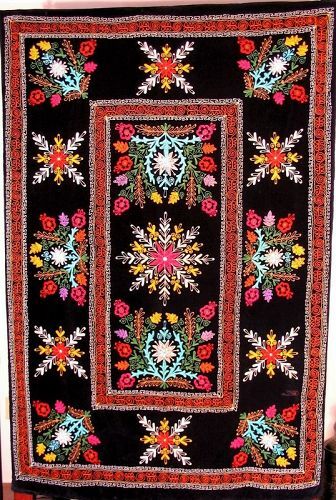 DESCRIPTION: A vibrant Suzani coverlet, finely embroidered with colorful silk threads on a black velvet ground. Suzani (meaning “needlework”) is a type of embroidered tribal textile made in Uzbekistan, Kazakhstan and other Central Asian countries. These coverlets are traditionally made by Central Asian brides for their dowry and presented to the groom on the wedding day.